Jim’s Antennas are fully licensed with the ACMA Cablers Open Licensing and are fully trained and experienced to install additional Phone and Data outlets around your home or business. In today’s home and offices multiple devices require internet connection either through wifi or hard wired connections. This is a great question to discuss with your installer as typically you want to hard wire as many devices as possible including static computers and your Smart TV’s to allow laptops and personal devices free connection to your wifi network. If you already have phone and/or data points but want to make sure these are in the optimal location we can help evaluate your existing set up and recommend new cabling to increase bandwidth and speeds in your local network if we think there could be improvements. Your existing phone and/or data lines may also require repair. Our technicians will repair if possible and replace only if absolutely necessary. The installation of phone and data outlets is a regulated industry, so all technicians require an appropriate licence. 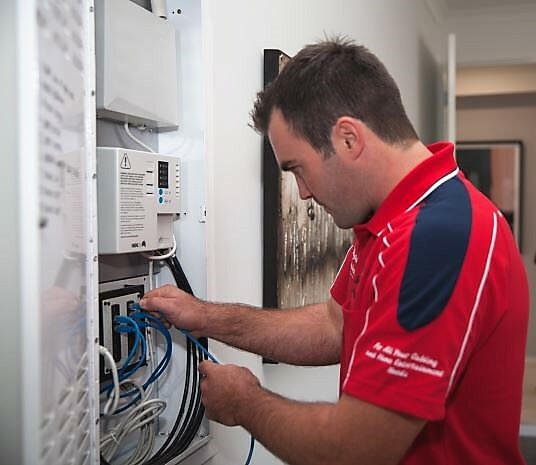 Our technicians have undergone extensive theory and on the job training so you can be sure we meet the legislated standards for installation. So don’t trust just anyone for your phone and data service requirements always ask your installer for a copy of their cabling license. Jim’s Antennas are here to provide you with the service you need to run all the devices you want in your home. Call now on 131 546 or simply fill in our online contact form for a free, no obligation quote.